We finally have our full SVCC Kids Sunday schedule up. We expect it to fill up fast so make sure to sign up right away. You can choose any combination of our 4 kids workshops happening all day Sunday, but you'd better hurry because workshops will filling up fast. We are limited to 200 kids. 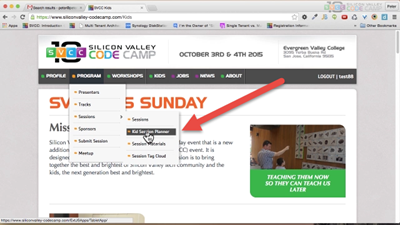 More information can be found on SVCC Sunday Kid's Director Arun Gupta's blog (we realize this blog post is from 2015 but nothing has changed in the registration process). PS: We are scheduling all our Professional Sessions next week and plan on publishing the full schedule soon there after. PPS: Cost is $50 per kid, each kid needs to have a unique email address. 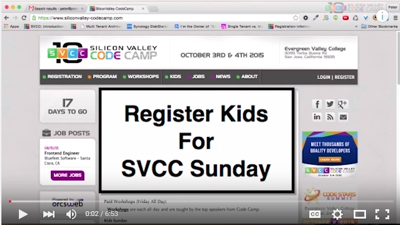 Parents need to be registered for SV Code Camp and that has no charge.